Finally meeting in person. Deverill Weekes, Juliet Landau and me at the International Make-Up Artist Trade Show, Vancouver Convention Centre (East Building), October 14, 2017. Picture: Erin Chapman. On October 10, 2017 I woke up to a lovely message from Deverill Weekes on Facebook. 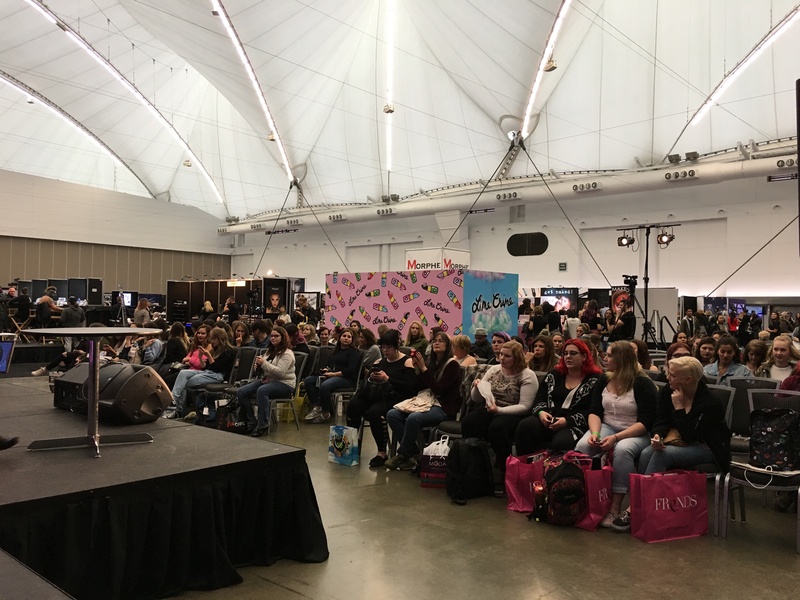 He wanted to know if I lived in Vancouver and was able to attend the International Make-Up Artist Trade Show (IMATS) on October 14, 2017 at the Vancouver Convention Centre (East Building). His wife, Juliet Landau, was participating in a Buffy Reunion Panel. They would be in town and able to meet me, but only on that day. For those of you that aren’t familiar with Juliet Landau, she’s best known for playing the vampire, Drusilla, on the TV series Buffy the Vampire Slayer (1997–2003). Fan favourites. Spike (James Marsters) and Drusilla (Juliet Landau) were popular vampires on Buffy the Vampire Slayer. Picture: The WB; Dazed. I was introduced to Deverill and Juliet back in 2015, when Vamped interviewed Juliet about crowdfunding her new vampire documentary called a A Place Among the Undead; however, we had never met in person. We helped them promote their Indiegogo campaign and even helped organize an exclusive Q & A with Juliet and her fans. Since they are situated in Los Angeles, having both of them be in Vancouver was too good of an opportunity to miss. I managed to switch my shift at work and Deverill arranged a guest pass for me at the trade show. I brought a friend with me so I had some company. 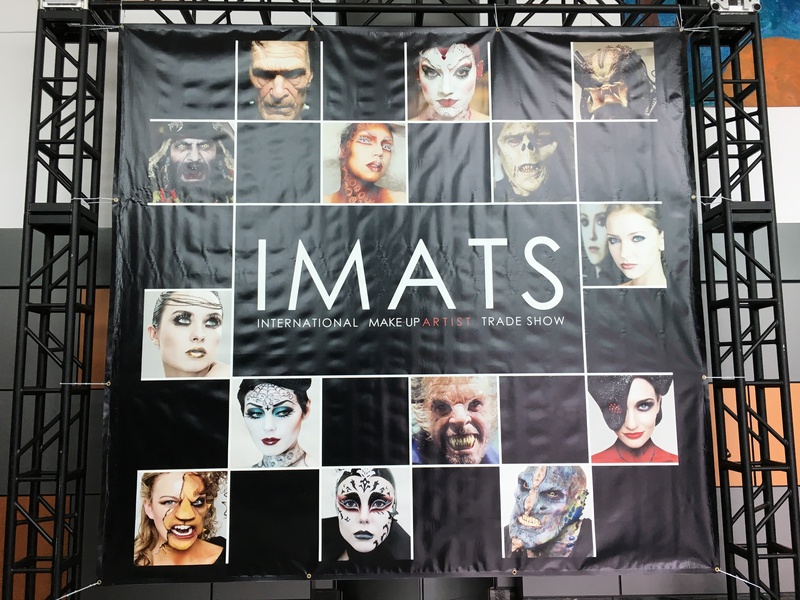 IMATS. Over the years I have been to many trade shows at the convention centre, but never one for make-up. Picture: Erin Chapman. I picked up a fluorescent green wristband at the IMATS check in counter and submerged myself into a world of make-up and special effects. I didn’t know what to expect as normally I don’t wear make-up and have very little knowledge about it. My friend, who loves it, saw all the booths and was super excited. It looked like sales were a huge part of this convention. 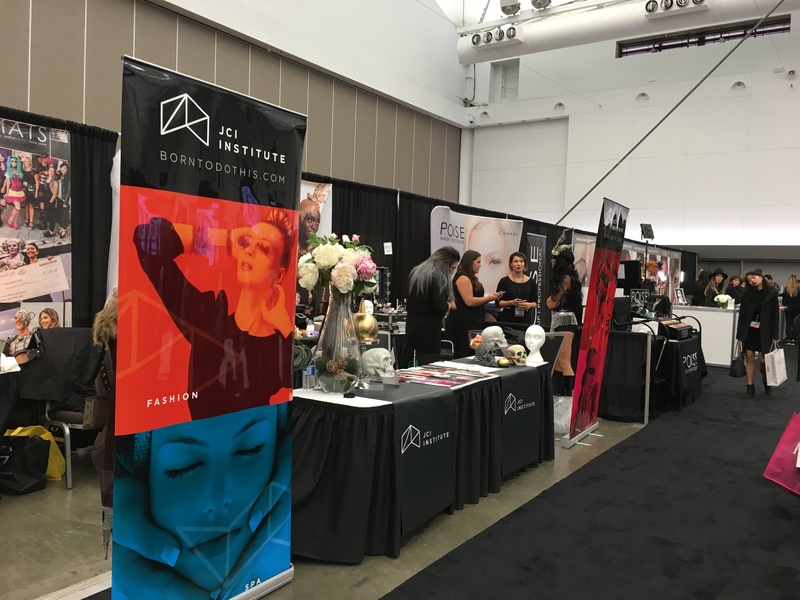 Many of the booths sold products like brushes, make-up, and accessories. I have never seen so many brushes in my life. They seemed to range from $5–$40, depending on the brand and the booth. Make-up education. Other booths were set up by training institutes where they offered classes in beauty make-up or special effects. Picture: Erin Chapman. I noticed one booth had a lineup of about fifty women. Turns out they had a huge special on fake eyelashes that was worth the wait. 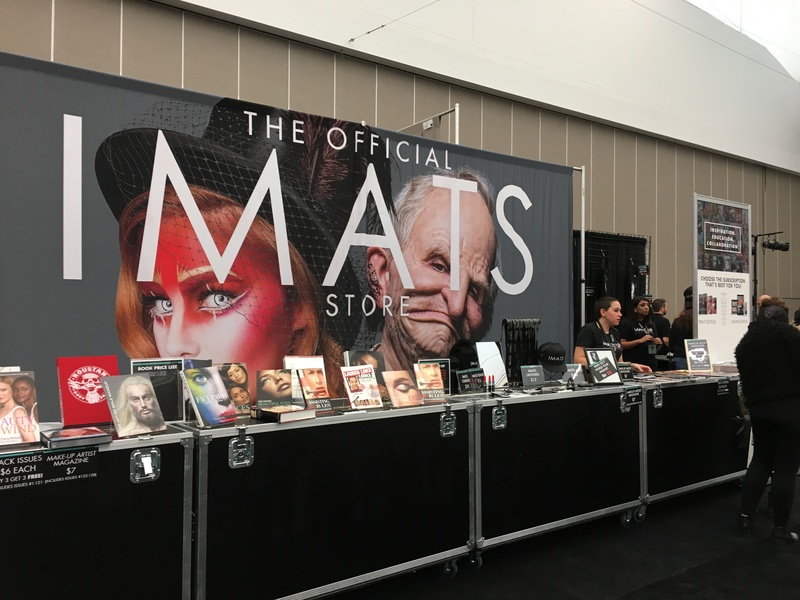 IMATS had their own setup as well, where you could pick up branded merchandise, swag, magazines and books by presenters and industry professionals. Official merchandise. This booth didn’t have huge lineups like the others, but they had some nice official IMATS products like clothing, lanyards, and hats. Picture: Erin Chapman. We located the Open Forum Stage, where the panel was being held, and managed to get the last two spots in the front row. The turnout was pretty good and all seats were filled up by the time the panel started. Limited seating. Rows of Buffy fans eagerly awaited the panelists. Picture: Erin Chapman. Before the panel started, I spotted Juliet and Deverill over at a photo booth that was set up behind the audience towards the side. I wandered over to say hello. Juliet was talking to two guys, who I figured out based on the badges they were wearing, were two of the other panelists. I introduced myself to Juliet and at first she was confused. I told her “Vamped,” and then right away she smiled and hugged me. We chatted for a few minutes before she took the stage at 4pm. 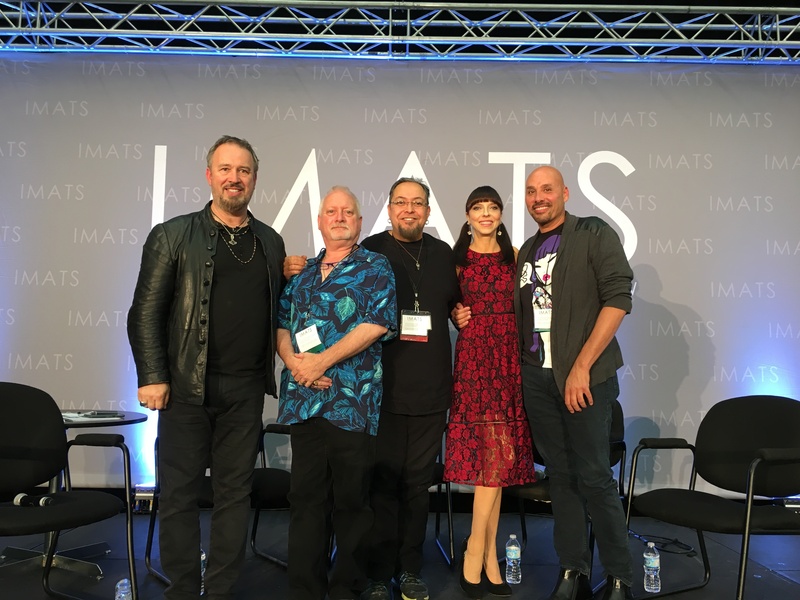 The panel was hosted by Michael Key, publisher of Make-Up Artist Magazine and producer of IMATS. Participants were Todd McIntosh, Thomas E. Surprenant, Juliet Landau and David De Leon. As you said earlier, your A Place Among the Undead vampire documentary series is based on vampires in pop culture. Buffy the Vampire Slayer was such an epic part of vampire pop culture, how will it be incorporated into your documentary? Juliet was pleasantly surprised I asked about their project and explained that they have interviewed some of the actors from the show, one of them including Anthony Head who played Giles. She met up with him in London where he was doing a theatre project. I wish I could have gotten her exact response as she made it sound way more exciting than I am right now. After the panel finished, I asked all the panelists to cuddle in for a photo. Amazing panelists. L-R: Michael Key, Todd McIntosh, Thomas E. Surprenant, Juliet Landau and David De Leon. Picture: Erin Chapman. I went to introduce myself to Deverill at the photo booth where he was still working, as Juliet interacted with a crowd of fans by the stage. He had the same reaction when he met me as Juliet. At first he was confused until I mentioned Vamped, then I received another hug. 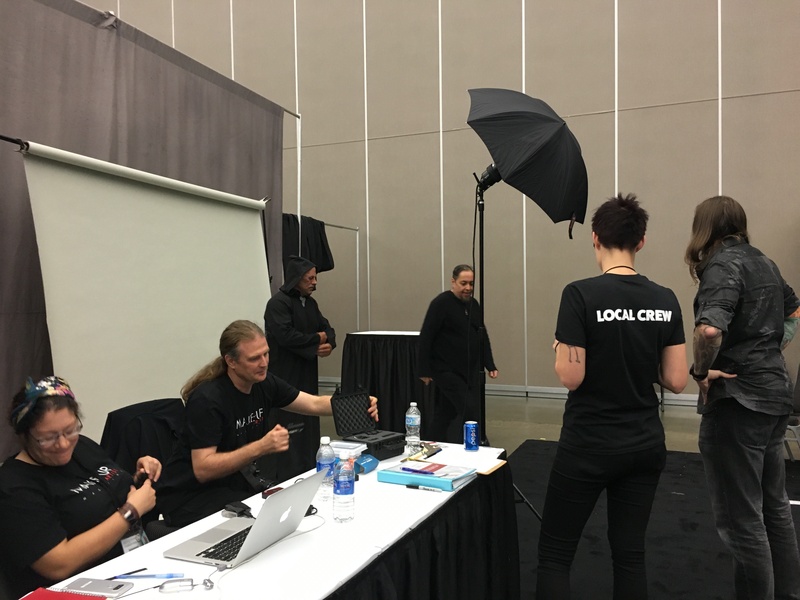 We had a few minutes to chat and discussed their vampire documentary, what I was working on with Vamped and our new site Vampire Classifieds. When Juliet was finished, all three of us got together for a photo (the one at the start of this post). It was the first time we met in person and I needed one to add to my growing photo album for Vamped memories and this article. Meeting Deverill. He was packing up his equipment, but managed to squeeze in one more photo of a gentleman with some ghoulish looking makeup. Picture: Erin Chapman. I really enjoyed the Buffy Reunion Panel. It gave fans a rare glimpse behind the scenes for the show. The panelists shared funny stories about the cast and crew, equipment challenges and how some make-up applications had to be improvised. My favorite stories were when Juliet explained about how she got hired for the show and how press-on nails can cause wardrobe malfunctions. I also enjoyed when Todd explained how little things like mold on a rug inspired some of their looks for special effects. I can’t give away too many spoilers. You will just have to watch the video. Juliet and Deverill were both humble and friendly. It was fun to meet someone in person that I used to watch on TV when I was younger. We agreed next time they were in Vancouver, we would have to go for dinner. when Vamped interviewed Juliet: Erin Chapman, “Interview with Juliet Landau, Director of “A Place Among the Undead”,” Vamped, October 28, 2015, accessed October 26, 2017, http://vamped.org/2015/10/28/interview-with-juliet-landau-director/. an exclusive Q & A with Juliet and her fans: Erin Chapman, “Vamped Exclusive: Live Q & A with Juliet Landau,” Vamped, November 11, 2015, accessed October 27, 2017, http://vamped.org/2015/11/28/vamped-exclusive-live-q-a-with-juliet-landau/. If you’d like to know more about Juliet’s documentary, follow its Facebook page.